Today I am over at Novelicious, sharing my Top 5 Writing Tips. Here I am writing about love and loss and how I came up with this novel over at John Scalzi’s Big Idea. I talk Wonder Killing, roller derby, TWoP, murderous crackheads, Star Wars, Anne Heche and my time in anime as I babble while getting more and more nervous over at This American Wife. I make a Spotify playlist for YOU TAKE IT FROM HERE over at Largehearted Boy’s Book Notes. Early press for You Take It From Here has been most kind. Special thanks to Jennifer Weiner for placing it high on her summer must-reads list alongside some amazing authors (and Molly Ringwald! Enjoy that, Little Pam!). At NPR’s Monkey See blog, Linda Holmes writes a beautiful piece about writing and literature, comparing my book and Jennifer Weiner’s latest to Johnathan Franzen’s Freedom, and how they make you feel. She was then kind enough to mention the book (and Going in Circles) on that week’s Pop Culture Happy Hour Podcast. Danielle Turchiano wrote such a heartfelt review I wanted to send her a case of Kleenex. Noelle Wittkop also wrote a glowing review. And she called me her “favorite author” so she gets an A+ forever. Just a Guy Who Reads Books sort of begrudgingly enjoyed the book, but needs to spend some time in Louisiana to see why Smidge’s accent can’t just be from any rando Southern town. Speaking of reviews that sound like they’re going to be bad ones but end up being great, the reviewer over at The Readers Cafe wanted to hate this book so much she was practically salivating. Instead, I made her feel things and then she cried. Success! Thanks to everybody who’s been supportive and/or patient throughout this book-hype time. It’s hard to sell books, you guys. I’m sure you know that, but if you don’t, I’ll say it again. Selling books is hard. If you’ve bought a book at all in the past month, by anybody, you’re a damn hero in … my book. Okay, I have more words due in other places, which means I will write them while obsessively checking Amazon and Goodreads every eighteen minutes. I didn’t know per-ordering helped you, but I’m extra glad now that I did. I am eagerly awaiting my delivery, and I almost want to order another one as a gift for my BFF, but I’m scared it’s going to be too sad. I should probably just do it though. I’ve loved your writing for years – very happy to have a new book to read. 1 – Higher pre-orders signal to book resellers like Amazon and B&N that they need to order more copies. 2 – Higher pre-orders signal to your publisher that they need to do a larger print run. I feel like your BFF would know your heart was in the right place, and I promise the novel’s more funny than sad. Thanks for the pre-order information, it makes sense. I’d like to pre-order a copy for my Kobo reader, but I’m kind of new to the world of Kobo, do you know if I can pre-order there? Does the US even have Kobo – or is it a Canadian thing? If I can’t pre-order Kobo, I’ll just order another physical copy. I only know of Kobo because Dave, who designed the site, links to it on my main page. They have all my other books, but no mention of this one. I’m not so familiar with how Kobo works, but it looks like they don’t do pre-orders. It is Canadian – our version of the Kindle, I guess, it’s affiliated with a large bookstore chain. I’ve emailed them about pre-orders, but I’ll probably have to wait until release date if I want to get the book electronically. Pamie, I just pre-ordered the hell out of your book. Don’t know why it took me so long! Best of luck to you on the tour, hoping to catch you in the Bay Area! Pre-ordered back in January – very excited for you for next week! A January pre-order is very impressive. Thank you, Stephanie. In the past I have signed Kindle covers, and I’ll have little promo cards for the book that I can sign and you can stick inside your Kindle (or some past book of mine you might have bought). Hooray! Thanks, Karen! I had pre-ordered the book but had to cancel it because of severe money problems. I am so sorry, Pamie, but I promise I will re-order the book as soon as I can. That’s okay, Meg! I’m sorry about your money problems. I know your heart is always in the right place. I’d ordered one for myself (in January) as well as a Kindle copy (in February). But I always buy a few copies of your books for friends so went ahead and ordered them today so they’d count in your pre-orders. Amazon is still telling me they won’t come ’til the 6th. Odd. The one for my Kindle says it’ll be delivered on the 3rd, though, so I’m all set no matter when the non-digital copies arrive! Lady, I can’t thank you enough. Amazon is estimating the shipping on that 6th, but the books ship whenever they’re ready. I’m not sure if the holiday is what makes them give a delayed date, but every previous book I’ve written delivered before the release date. And yes, your Kindle book will be there at midnight on the 3rd. Hooray! And thank you again! Does pre-ordering on Kindle help at all? That’s my preferred reading delivery system these days. Yes, that helps, too! Thank you! i’ve just pre-ordered coz i want to help you…. Thanks, Sian! I was just looking at your site… That monster biography you just got seems fascinating. oh it is – i cannot stop reading it.. Here is the reason I already pre-ordered…I’ve been immensely enjoying your writing for years now without having to pay a dime, both here and at TWoP. Even though this doesn’t seem to be the type of book I would normally read, I’m happy to throw a little coin your way to say THANK YOU for the hours of entertainment you have provided. Good luck with the book, and much deserved success! Virtual hug to you, Scott. Thank you so much. Oh, and now I get to update and say that I just started the book this morning, am already over halfway through (even though I am technically at my office “working”), and I have already cried five times. Hooray for trying new things! Hope to see you on the 20th in the ATL! I preordered a copy from my local bookstore on IndieBound. I hope that still helps you! Thanks, Stephanie! I believe that sale will help once the indie store reports back to BookScan or the publisher or something like that. Book sales are slightly mysterious. After reading this I just pre-ordered for my kindle.. I also didn’t know that pre-orders helped. . I hope that you have an awesome release day!! Lots of good vibes your way!! Thank you, Becca! See you soon! I Pre-ordered weeks ago and I’ve been counting down the days till the 3rd so I can download it on my kindle!! So looking forward to devouring it tomorrow night. Since I’m a lameass who has to get a bunch of roller derby ads done for the next game(I’m fantastic at procrastination!) as well as get ready for a weekend motorcycle trip, I can’t crash your LA book signing. So I bought your book for my Kindle instead. Win/win! Thanks, Tara! You still got a shout-out last night. Sorry I missed the pre-order but got my order in today. I have a Kindle but I got the physical book so I can share it. Books rule. Thanks a lot auto-correct. Nice name you gave me. Pamie – thanks for the link-back! Congrats on the Scalzi Big Idea – that will almost certainly help your sales more than my little blog. Thank you so much, both for the review, and for this above. I was joking a little about your grudging enjoyment; you’re the second review I’ve gotten along the lines of “I was really prepared to hate this, but I ended up enjoying it.” Which, I have to say, is flattering/rewarding. Thank you again for taking the time to read and review the book on your site, and if you do read any of the others, thanks in advance. 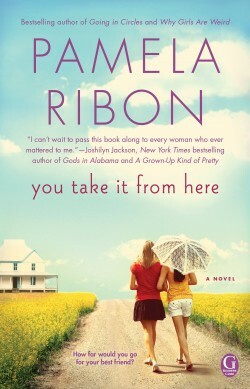 Congrats on the new book, Pamie! I can’t wait to read it! Any chance you’ll be in Las Vegas for your book tour? Vegas seems unlikely. But if I did a reading inside a casino, I bet my mom would show up.